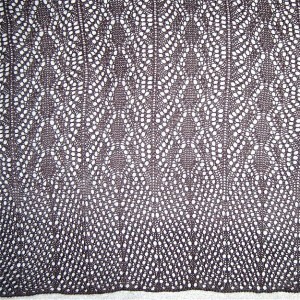 I am trying to knit a shawl in the latest lace scarf pattern repeat. Using most of needle bed is making it necessary to take KH far off the end of the KM, ergo the bungie cord (which may keep extension rail from going out the window with the KM if I reach appropriate frustration level). Knitting in black is great on aging eyeballs! My studio is my attic space, and as can be seen this punchcard machine is nestled at the moment in a very “neat” corner of it. 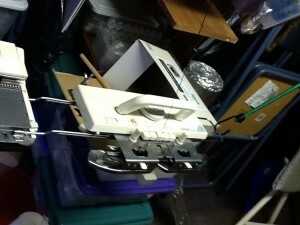 I own 2 lace carriages for Bro punchcard machines, one is appropriate for this KM, the other for a later model. The usual mantra is not to exchange carriages between models without cautious evaluation, it is sometimes simply not workable. 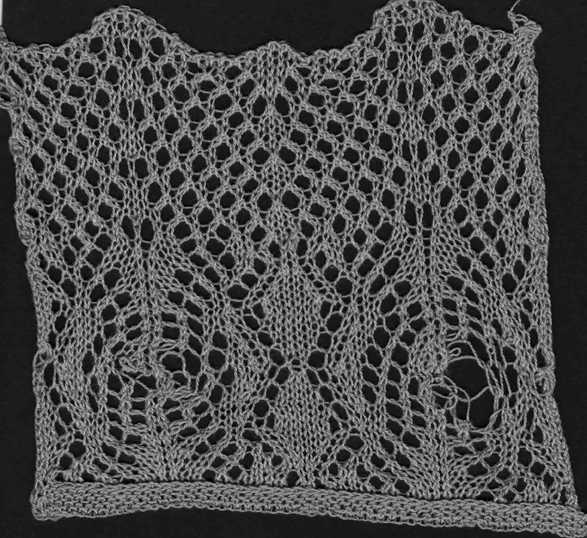 For lace, I found the “correct” carriage drops stitches easily, the “incorrect” one is harder to push, but drops far less often. I mark the punchcard rows on which the arrow markings occur/ need to be placed by drawing across that row with a colored pencil; in addition to serving as a reminder for when the knit rows with the opposing carriage need to happen, this gives me reference points for the beginning of each transfer sequence for correcting mistakes when unraveling back to last knit row. 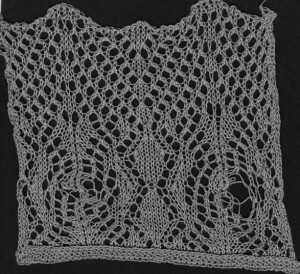 Because this lace is much more labor intensive than that used in the previous shawls the plan is to knit in a border at its top rather than on rehung open stitches, one at a time, sideways (this can take several hours and a lot of patience). With half the shawl completed, the snugly around 2 gate pegs bind off ran completely away from me (slippery rayon and black = o goody!) and it took a couple of hours to rescue the piece and get back in pattern. The wavy border idea is now ditched in favor of not having a repeat of the above experience. My shawl will now have a far straighter top and bottom edge as a design feature. 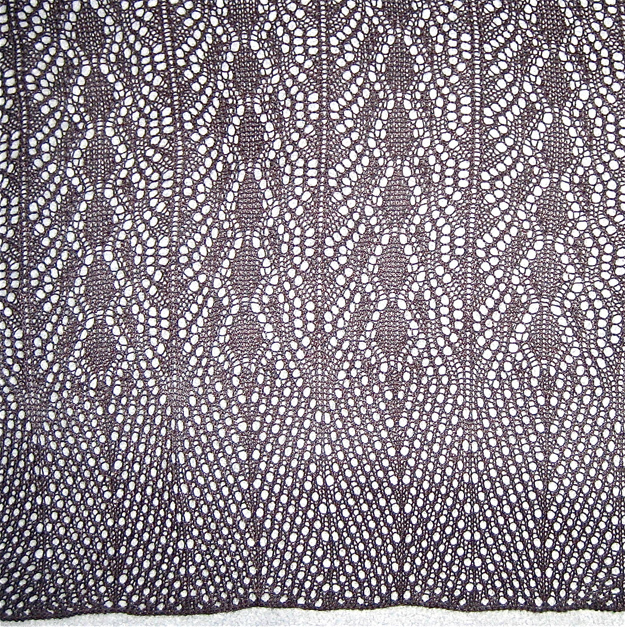 Second half of shawl planned over the next couple of days. “Grecian formula” where are you?